And that's your lot. Liverpool will be sick at the sight of Crystal Palace, after another defeat against the Eagles. Have a read of the match report. Crystal Palace manager Alan Pardew: "We came here with ambition. The worst thing that happened to us was scoring, we then lost the ambition. Liverpool came on to us. "We went toe-to-toe against Manchester United and got a draw, we went toe-tote toe with Liverpool and got the win. "I thought Wilfried Zaha had one of his best games for Crystal Palace. His defensive work was important too. Wilf had to do a job on Philippe Coutinho and he did that. I was very pleased for him. "Sometimes it is about our own belief. We have been unlucky in the last few games. We have been good this year and started really well. We need to make sure we capitalise on that. "I promised the guys an extra day off so fair play to them. They can book some flights now." Liverpool manager Jurgen Klopp: "Today is a bad feeling - it was not necessary to lose this game. We were better team but for the first 15 minutes we were not on the pitch. We got the goal, we were awake, we started creating chances. "But after the break, we gave them chances to call us problems. Then we woke up again, but then couldn't make a goal. It feels so bad because it was not necessary. This was not enough for us - we can do more. We have to learn from this." Liverpool hogged possession, dominated territory and had a whopping 22 attempts at goal. But for all those numbers they didn't test Palace keeper Waayne Hennessey enough. The Reds only managed four shots on target, the same as the visitors. Palace matchwinner Scott Dann: "We knew we would have to come here and play well. We wanted to start fast on the back of them coming back from a long trip from Russia. We let them back in the game, but wanted to show what we were capable of. I think it was a deserved victory. "We've got pace and power out wide and up front and we can hurt teams. Coming here and winning shows the ambition we have got. Some teams come and sit back but we know we're capable of hurting teams like them." On being a Liverpool fan and scoring the winner at Anfield: "I have had dreams of scoring here - and I had a feeling before the game that I was going to score. So it is a nice touch. I'll probably get some stick from family and friends but they support me as well!" Palace scorer Yannick Bolasie: "We started really fast. The gaffer's tactics were spot on. Credit to the team we got an early goal but Liverpool came back into the game. But we got the winner and managed to hold out." On Palace's good recent record against Liverpool: "It is the gaffer's tactics, he knows them inside out. We exploited the spaces and today it came off. "We've been on a bumpy road recently and we've achieved our target today. Three points are massive - it was like a cup final for us." Some thumping ragga music is pumping out of the Palace changing room as Yannick Bolasie is being interviewed in the corridor. Party time for the away players. The Eagles are soaring again. After four winless Premier League matches, this Anfield win moves them above their opponents - and Everton - into eighth place. All over! Scott Dann's grin is wider than the River Mersey. The Liverpool-born Palace defender is the matchwinner at Anfield, his late header condemning Jurgen Klopp to his first defeat as Reds boss. Honeymoon over. Liverpool huffing and puffing but can't blow the ball into the Palace net. The away end are bellowing their team towards the final whistle. Noooooooo! Liverpool fans are tearing their hair as Nathaniel Clyne shoots from distance. He's a right-back - he's never going to score from there. Palace fans ironically cheer. Obviously. Four minutes of stoppage time for Liverpool to rescue this. Four minutes for Palace to hang on for a brilliant away win. Liverpool might as well be armed with flagpoles and a ground sheet. They are camped in the Palace half. Desperate times call for desperate measures. Divock Origi gets the nod from Jurgen Klopp, replacing Jordon Ibe as Liverpool desperately try to force an equaliser. Philippe Coutinho tries his luck from distance, drawing a top-class save from Palace keeper Wayne Hennessey. Back slaps all round for the away stopper. Eight minutes, plus stoppages, for Liverpool to avoid a first defeat under Jurgen Klopp. The German, for once, is not grinning. Alan Pardew is however looking as pleased as a bloke who has just found out he is having pie, chips and peas for his tea. Can believe it! Scott Dann goes from defensive hero to potential match-winning hero. The Palace defender, who moments earlier headed away a dangerous Jordon Ibe cross, puts Palace back ahead! The Scouser heads a corner at Simon Mignolet, but reacts quickest to nod in the rebound. Great defensive header frrom Scott Dann, heading away from his own goal when Jordon Ibe swings in a low cross across the face of the away goal. Time for a Palace change. Joe Ledley, him of the caveman beard, comes on for Jason Puncheon. Nathaniel Clyne has his name taken by referee Neil Swarbrick for hacking down his old Palace team-mate Wilfried Zaha. Yohan Cabaye smashes the free-kick into a red shirt and then wastes the second opportunity by dragging wide. Very open game here. The ball blows around the Palace box like an autumnal leaf in the wind - but no-one can stick their foot on it to catch it. Christian Benteke tries and fails, then Roberto Firmino smashes over the bar. Simon Mignolet has not been forced into much action - but he needs to be alert here. Jason Puncheon lets fly from 20 yards, a deflection off a Liverpool toe sending the ball sneaking inside the left post. But Mignolet leaps across to save. Adam Lallana tries his luck from distance for Liverpool. Speculative. Never going to trouble Wayne Hennessey, the Palace keeper whistling as the ball sails over. Nervous? You should be. This match is teetering on the edge. Could go either way. Twenty minutes for someone to find a winner. Not only has Pape Souare got a headache for bashing his head against the advertising board earlier, he now has a disciplinary headache. The Senegal left-back goes into the book for hauling down Jordon Ibe close to halfway. One more of those and he'll be heading down the tunnel early. A roll of the tactical dice from each manager. Jurgen Klopp plays his Roberto Firmino card, Alan Pardew responding with Connor Wickham. Firmino replaces Emre Can, while Wickham shakes hands with Bakary Sako. Twenty five minutes for either to come up trumps. End-to-end stuff! Now it is Liverpool's turn to go close, Christian Benteke again using his considerable aerial ability to climb above the Palace defence. Again. he can't keep the header down though. Roof of the net. Palace manage to see out that Liverpool corner - and then break quickly. Bakary Sako arrives into the Liverpool penalty area after a brilliant run by Wilfried Zaha down the right, but skews his shot from a tight angle into the side-netting. But Palace's temporary numerical disadvantage does not hamper them, Wilfred Zaha cutting in from the left but unable to test Simon Mignolet. Palace skipper Damien Delaney and Liverpool midfielder Philippe Coutinho tangle near the away byeline. Alan Pardew wants a yellow card and grins when it is not forthcoming. Jurgen Klopp grins because, well, he always grins. Palace continue to build a period of pressure, some neat interplay around the edge of the Liverpool box creating an inch of space for Jason Puncheon. He slashes a shot goalwards - well, I say goalwards... It ends up going out for a goal-kick right next to the right corner flag. Palace get the ball down, building from the back as Liverpool try to press high. Papa Souare is picked out on the left flank by a Hollywood pass from Jason Puncheon, his cross slamming into Nathaniel Clyne. Souare claims it was handball just outside the box, but gets nothing for his efforts. Liverpool still hogging possession, almost camped in the Palace half at the moment. Jordon Ibe tries to slalom through a host of away challenges and into the penalty area, eventually dispossessed before Palace hack clear. Now here's a chance that would have had Steven Gerrard and the rest of the home fans jumping to their feet and spilling their half-time drink over their lap. The ball drops to Christian Benteke about 12 yards out, he outmuscles his marker, but smacks wastefully over the bar. Not much to report in the opening moments of the second half. Liverpool earn a free-kick for a Palace offside, then win a throw-in. Minor stuff like that. Steven Gerrard, back watching from the stands, is clutching a plastic cup of something hot. Tea or coffee presumably. Or maybe a Bovril. Referee Neil Swarbrick tots up the number of players back out on the Anfield pitch. All 22 are there, so he toots his whistle to signal the start of the second half. Liverpool go long almost straight away, gifting possession back to the visitors. Klopp grins a rueful grin. Absolutely biblical rain in Liverpool. Half expecting to see the substitutes row down the touchline in a dinghy as a warm-up. Players are heading back out. Liverpool have peppered 13 attempts at the Palace goal, although only three have needed to be dealt with by away keeper Wayne Hennessey. The Eagles scored with their only shot on target. These stats don't really do Palace's first-half display any justice. They have been far from battered as these numbers suggest. And James McArthur's crucial hack off the line from that Dejan Lovren header is enough to ensure that the teams are level at the break. Jurgen Klopp looks pretty pleased, well relieved, as he skips down the tunnel. Palace skipper Damien Delaney has barely put a foot wrong this afternoon, but when he does it is nearly punished by Liverpool. The visitors manage to clear their lines for a corner, before Dejan Lovren again goes close with a header. Into three minutes of stoppage time. Anyone going to go down the tunnel with a lead? How have Palace not been awarded a free-kick on the right edge of the Liverpool penalty area? Alan Pardew has no idea and is telling the fourth official as much. Yannick Bolasie is shoved over by Alberto Moreno - and ref Neil Swarbrick reckons that is legal. Palace almost find themselves 2-1 down! A Liverpool corner is met by substitute Dejan Lovren, but his downward header cannot squeeze past Palace keeper Wayne Hennessey. Pretty harsh on Palace is that equaliser. The away side have been well-organised, not allowing Liverpool a sniff, then springing forward quickly on the counter. Cometh the hour, cometh Philippe Coutinho. That seems to be the script for Liverpool these days. Coutinho arrives in space about 10 yards out to fire in low past Wayne Hennessey. Adam Lallana goes close to a leveller for Liverpool - almost as close as they have come. The England man's shot flashes wide. Mamadou Sakho springs back on to the pitch - but it almost proves costly. He gives the ball away and Yohan Cabaye sticks the ball in the onion bag with a precise finish from distance. Luckily for the hosts, the linesman has his flag wafting in the Anfield wind. Someone fetch the stretcher...Liverpool defender Mamadou Sakho is in serious pain. The France international competes for a high ball, landing awkwardly on his right ankle. Christian Benteke has a chance to make amends seconds later, again climbing higher than the away defence to meet Nathaniel Clyne's right-wing cross. However, the Belgian cannot keep his header down. Close. Earlier, someone (admittedly, cruelly) tweeted a video of an elephant tripping above a ball and likened its skills to those of Wilfried Bony. Well, it was more like this effort from Christian Benteke. The Liverpool striker holds his run to meet a fizzing cross from Adam Lallana, but almost stumbles over the ball as he prods it wide. Liverpool midfielder Adam Lallana (20) has picked up a position further forward than expected so far, while striker Christian Benteke (9) has been deeper in the first half an hour. Palace keeper Wayne Hennessey is forced into action for the first time. Christian Benteke, as he often does, outjumps the Palace defence at a home corner, only for the Wales keeper to deny him with a one-handed save. Murmurs of encouragement from the Anfield faithful. We've just been treated to another showing of the Palace opener - it really is schoolboy defending. The sort where one of the parents is shouting 'Clear your lines' as defenders swipe at the ball before an opponent bangs it in. Liverpool are coughing and spluttering into life like my grandad's old Ford Capri. Jordon Ibe makes a bit of space for himself in the right channel, cutting back to Philippe Coutinho. But his low first-time shot is blocked by Palace skipper Damien Delaney. What response have Liverpool got? Hmmm, little at the moment. Philippe Coutinho tries to spark something, but he is on a different page to Adam Lallana, who does not read his through ball. Palace keeper Wayne Hennessey gathers gratefully. 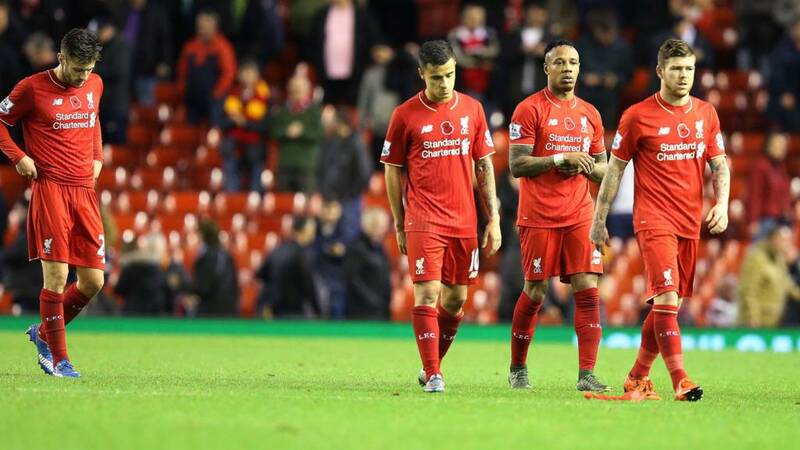 Liverpool are sluggish from their travels and have paid the price. The away end was making a right old racket before the goal - now it is rocking. The homes stands are silent. Now Liverpool's day has been dampened even further. Palace nab the opener that they just about deserve - helped by some terrible defending from the hosts. Alberto Moreno and Emre Can both make a hash of clearing the ball, allowing Yannick Bolasie to clinically fire in low through a crowd of bodies from 12 yards. This match is as drab as the weather. Steven Gerrard must be wishing he was sunning himself back in LA. Alberto Moreno is smacked in the chops by Yannick Bolasie as the pair jostle for a high ball. Moreno goes down clutching his face. Ref Neil Swarbrick waves play on. Liverpool's first corner comes to nothing, Palace clear. Little to report in terms of goalmouth action so far. Liverpool try to unlock Palace from a wide area again, this time a cross from Alberto Moreno looking dangerous. Palace left-back Papa Souare is alert at the far post to head behind for Liverpool's first corner. You know that impressive Palace start we've spoken about? Here's the evidence. Palace back on the front foot, forcing a corner which Liverpool head clear. And the Reds spring forward like a pack of cheetahs, turning defence into attack in the blink of an eye. Adam Lallana cross flashes across the Palace goal, but no red shirt is nearby to prod goalwards. This is better from the hosts! Philippe Coutinho, rested on the bench against Rubin Kazan, looks up and moves the Reds forward. The Brazilian exchanges a neat one-two with Christian Benteke, but is then dispossessed by a wonderful sliding tackle by Damien Delaney. Liverpool starting rather sluggishly, perhaps the after-effects of Thursday's jaunt to Russia. Little attacking spark from the home side. Positive start from Palace, just as we expected. Jason Puncheon reckons the away team should be awarded another corner as his cross sails out. Referee Neil Swarbrick having none of it. What a waste. Bakary Sakho hangs his head after overcooking the corner, lobbing the ball over everybody and out at the far side for a goal-kick. A collective moan from the away end can be heard. Palace have the honour of starting the shenanigans. Tipping it down with rain on Merseyside. Liverpool: Mignolet, Clyne, Skrtel, Sakho, Moreno, Can, Lucas, Ibe, Coutinho, Lallana, Benteke. Subs: Lovren, Firmino, Allen, Origi, Brannagan, Bogdan, Teixeira. Crystal Palace: Hennessey, Kelly, Dann, Delaney, Souare, Cabaye, McArthur, Zaha, Puncheon, Bolasie, Sako. Subs: Speroni, Ward, Hangeland, Bamford, Wickham, Mutch, Ledley. Mr Pardew meet Mr Klopp. The two managers shake heads for the first time, both wearing broad grins on the Anfield touchline. Then it is time for a moment of reflection as we have a minute's silence on Remembrance Sunday. Neither Alan Pardew nor Jurgen Klopp are known as shrinking violets on the touchline. Exuberant celebrations, haranguing officials, occasional rows with opposing benches - the full repertoire. Pardew has attracted attention for the wrong reasons in the past, clashing with the usually mild-mannered Manuel Pellegrini and Arsene Wenger - and headbutting Hull midfielder David Meyler of course. But he doesn't anticipate any bench-based beef with Klopp. "Whenever I've come up against a manager who's similar to myself on the sidelines - Tony Pulis is very tight to the touchline - I never have an issue really," says the Palace manager. "I like how he is on the sideline, I think you can send messages to your players in a positive way, and you've just got to be careful not to do it in a negative way." Steven Gerrard had his Anfield farewell ruined by Palace back in May, now he is back to see if his old club can gain revenge today. The home players have slinked out of the dressing room, shaking hands with their opponents in the tight Anfield tunnel. Nathaniel Clyne, the Reds former Palace man, is particular popular with the away men. "We haven't seen him in defeat in this country but every interview he gives there is a smile on his face. He has genuinely put a bit of fun into football." It would be a stretch to say that Alan Pardew is suggesting Jurgen Klopp is his doppelganger. But it makes a nice pun so let's go with it. Although they do both have floppy side-partings and matching glasses (when Pards sticks his specs on). Anyway, the reason I'm gibbering on about this is because Palace boss Pardew says he sees much of himself in his Liverpool counterpart. "I do see him on the sideline, and I look at myself and think 'That's very similar to how I am'," says Pardew. "He never gives too many negative things out, even though he's quite involved in the game, and I like to think I don't either." Jurgen Klopp, as usual, is out on the Anfield pitch, standing arms crossed on the centre circle, surveying the scene as his forwards have some last-minute shooting practice. No sign of Palace counterpart Alan Pardew yet. I reckon he's pacing around the changing room sinking a cuppa, ready for his players to return before unleashing some last-minute words of wisdom. Exactly a month has passed since Jurgen Klopp breezed into Anfield as Brendan Rodgers' replacement. And as months go it has been pretty sweet. Three draws eased the German into life at the Reds, before he ramped up the feelgood factor with three straight wins. “I’ve had some perfect moments of course but, for me, it’s not time to think about this. It’s been a very intensive month," he says. “There’s been no time to analyse my first month and I don’t want to analyse because we feel we are in the middle of the race and there’s no break for us. “As I said at the beginning, we have to turn small screws and that’s what we are doing at this moment, but the base was not so bad. Brendan did a really good job here." Rob Jagger: Thomas Gravesen to Real Madrid. Who would've believed that! Nick Morrison: Jonathan Woodgate to Real Madrid... 'nuff said. If Dwight Gayle is on board with us, then I'm sure the former non-league striker will be interested to find out what is happening in the FA Cup first round. Lower tier and non-league sides are scrapping for the right to move into round two, with 10 matches taking place today. Watch goals as they fly in right here on Final Score. And Palace? Just the two changes. One is enforced, striker Dwight Gayle is injured so Bakary Sako takes on the lone front role. The other is tactical, left-back Joel Ward dropping to the bench as Senegal international Pape Souare returns from injury. Here's a bit more meat on the bones of team news that I've thrown you. Jurgen Klopp makes four changes to the starting XI which began the 1-0 win at Europa League rivals Rubin Kazan on Thursday. Defender Martin Skrtel and midfield trio Lucas, Adam Lallan and Philippe Coutinho are return. Matchwinner Jordon Ibe keeps his place as James Milner (injury), Dejan Lovren, Joe Allen and Roberto Firmino (all on the bench) drop out. "When Palace went to Anfield at the end of last season, in Steven Gerrard's final home game, they bullied the Reds and won comfortably. But Liverpool look a different animal now and I will be surprised if Palace do not leave empty handed. "I'm going for a 2-1 home win." See how Lawro fared in his full predictions v the Wealdstone Raider. So with 35-year-old Dirk Kuyt being linked to Barcelona (that's European champions Barcelona), I want to know which crazy transfers that you remember thinking were nonsense but then actually happened. I'll kick you off - Eric Cantona leaving Leeds United for that team across t'Pennines. Tweet me your suggestions and we'll stick a selection of the best in. And, anything else Liverpool/Palace-related that you want to discuss, then let me know in 140 characters or less. Put your hands up for Dirk Kuyt! Craziest football story of the week? I've found a winner. Former Liverpool forward Dirk Kuyt has played down rumours of a shock move to....Barcelona. The 35-year-old Dutchman is back at Feyenoord - the club where he made his name - and tops the Eredivisie goalscoring charts after 10 goals in 11 games. And his form, the Liverpool Echo reports, had caught the eye of the European champions, who are thought to be looking to sign an experienced striker in January to serve as back-up. Severely damaging Liverpool's title hopes two seasons ago? Done. Ruining Steven Gerrard's Anfield farewell? Sorted. Imagine if Crystal Palace complete a hat-trick of deflating defeats for the Reds, winning today to end Klopp's magic carpet ride through Premier League life. Eagles manager Alan Pardew reckons he knows just how to do it. "We need to try and capitalise on what they are not good at and defending is an issue that club has had for some time and we aim to exploit that. We're looking forward to the game," he says. Stand-in captain James Milner is out with hamstring injury, Brazil midfielder Philippe Coutinho returns to the starting XI. Liverpool XI: Mignolet, Clyne, Sakho, Skrtel, Moreno, Lucas, Can, Lallana, Ibe, Coutinho, Benteke. Palace striker Dwight Gayle was struggling with a unspecified injury - and he is not fit enough to play at Anfield. Palace XI: Hennessey, Kelly, Dann, Delaney, Souare, Zaha, Cabaye, McArthur, Puncheon, Sako, Bolasie. But the self-proclaimed 'Normal One' is proving that routine can be fun. A routine of not losing since arriving at Anfield. Six matches, no defeats. From the moment that Liverpool announced they had given a P45 to Brendan Rodgers, the clamour began for one man. And that bloke is living up to his billing. That toothy grin. That infectious laugh. That ability not to lose football matches.